Todd runs away from Adelaide and takes refuge in Cody's room. Apparently Todd had a row with his much for nagging her to go back to Adelaide, so he withdrew all the money from his bank account and bought a train ticket back to Erinsborough. 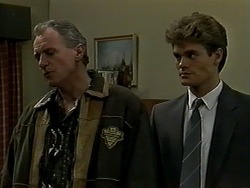 Cody wonders if Jim will have Todd back - he doesn't think so though as his mother wants him back. Todd reckons the only person who can help him is Helen. Cody tells Todd that Pam has incredible radar - she looks worried. They'll have to be very careful. 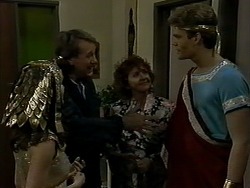 Adam and Caroline are back from the Uni ball, still dressed as Anthony and Cleopatra. 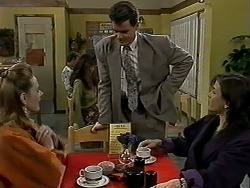 Pam admires Caroline's costume and Doug offers them a coffee. Apparently the ball wasn't great - some of Adam's friends were a bit full-on! One was dressed as Dracula and kept trying to bite Caroline on the neck(!) Doug thinks it's comforting to hear such stories about medical students(!) Pam drags Doug off to bed. Caroline tells Adam that she really enjoyed the ball tonight. Pam and Doug call Cody for school. She says she's not feeling very well with a headache and asks if she can stay home. Doug tells her that she can't miss anymore school and anyway, it'll take her mind off things. 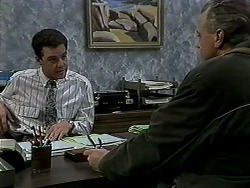 Jim comes over and asks Cody if he she's heard from Todd. She says she hasn't. Jim explains to Pam and Doug that Todd has gone missing. Cody feigns concern and Jim tells her to let him know if Todd turns up. Christina comes in to find Melanie exhausted from too much typing! She invites her to lunch at the Coffee Shop. Caroline comes in with mail (seemingly wearing a Star Trek outfit!). Christina tells Melanie that she's supposed to be checking the mail every day in case her letter is re-directed! 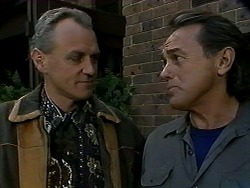 Melanie rushes into the inner office and snatches the post off Caroline, but Paul comes in and takes it instead. PAUL:(looking at the mail) Paul Robinson...from Melanie Pearson! Buenos Aires. Melanie and Christina look horrified and run out at speed! 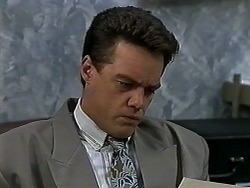 Meanwhile, Paul opens the letter and frowns. Todd sneaks out of Cody's room to get some juice from the fridge. He drinks it thirstily and while he's doing so, Pam comes in. He hides behind the unit. The phone rings and when Pam goes to answer it, Todd takes the opportunity to hide behind the sofa. Unfortunately for him, it's an old friend of Pam's and she settles down for a nice long chat! Melanie and Christina are discussing the war when Paul and Isabella come in. Paul comes over and asks Melanie about the letter. Christina feigns ignorance and says she wasn't upset about the bracelet. 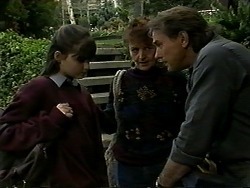 Melanie says she got it all wrong, and Paul tells Melanie not to stick her nose in people's business. But anyway, there's no harm done. Jim comes in to invite Paul and Isabella over to dinner tonight, but they are going out on the town. He invites Paul over for a drink instead, and Caroline too. But Caroline awkwardly refuses, and then Adam comes to pick her up. When they've gone, Jim asks if Caroline and Adam are an item. He looks a bit depressed. Doug and Pam are having lunch when Adam comes in. Todd is still behind the sofa! While they're talking, Todd finally decides to make a break for it. He makes it back to Cody's room, but Adam decides to go in and borrow her walkman! 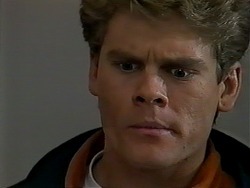 Adam comes in and is shocked to see Todd there. Isabella arrives home and greets Christina. She tells her she's cooking a special dinner for them all for tonight. Christina is confused - she thought they were going out. Isabella says she is, but she still likes cooking for the family. CHRISTINA: You don't have to wait on us hand and foot! ISABELLA: Christina, do you resent my being here? CHRISTINA: No, of course not, why should I? ISABELLA: Because of your feelings for Paul. Isabella asks about the letter, but Christina assures her that Melanie got it all wrong. Isabella doesn't believe her and offer to leave. But Christina says there's no need for that - it's Paul's house and they can try to be friends. Cody is raiding the fridge and Adam asks her sarcastically why such a little girl needs so much food. Adam tells her pointedly that he went into her room to look for a walkman today. ADAM: You wouldn't believe what I found in there today? CODY: I can't guess. I don't want to guess. What did you find? ADAM: Calm down, why do you look so worried? Adam tells her that he knows Todd is hiding in her room and she begs him not to tell their parents. He agrees not to say anything, but warns her that sooner or later they'll have to face the music. Isabella has left Christina, Caroline and Melanie a magnificent paella to eat. Caroline (still in the Star Trek outfit) asks about the letter, but the other two are evasive. Caroline serves up the paella while Melanie raves on about how beautiful Isabella is, but on Christina's look says she'll probably get fat when she's older(!) Caroline comments on how good Isabella's English is - even though she taught herself! CHRISTINA:(snapping) Well, is this a meeting of the Isabella Lopez fan club or what?! She explains that she's sick of hearing how wonderful Isabella is. Caroline warns her that she agreed she'd learn to handle sharing a house with Isabella, but she counters that she just doesn't want to talk about her all the time. Adam is off to drive the limo, leaving Pam and Doug in front of the TV. Jim pops around to see if there's any news about Todd. Adam looks concerned, but doesn't say anything. Jim wants to talk to Cody - maybe she's hiding something. Pam says Cody is in bed, but she'll ask her again in the morning. In Cody's bedroom, Cody and Todd are curled up next to each other, asleep. Adam comes in to wake Cody up. She runs out to the shower while Todd just pulls the duvet over his head. In the living room, Doug and Adam head off to work. Pam goes to call Cody. 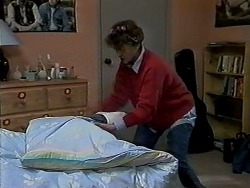 She goes into Cody's bedroom and pulls back the duvet. She's shocked to find Todd in Cody's bed!